Philip Blumel: The Federal Government has shut down but the term limits movement hasn’t. Hi. I’m Philip Blumel. Welcome to No Uncertain Terms, the official podcast of the term limits movement for the week of January 21st, 2019. Philip Blumel: We’ll discuss today what’s happening in the states and what is not happening in Washington, DC with US term limits Executive Director, Nick Tomboulides. Nick Tomboulides: Happy Monday, Phil. Philip Blumel: So what’s going on down in the states? We’re seeing some action I hear. Nick Tomboulides: That’s right. That’s right. Terms limits activists are sweeping the nation. The state legislative sessions are getting started all over the place and our team is working with state legislators and working with volunteers on the ground to get the term limits convention bills filed. Nick Tomboulides: Remember this is the way that states are going to take power back from Washington, DC, implement term limits on Congress by calling a convention and this week we’ve actually had three term limits bills filed in three very diverse states, New Hampshire, Vermont and West Virginia. Philip Blumel: Okay. Fantastic and of course this … We talked in last week’s podcast about how the federal term limits bill has been dropped in the US Congress and so as we’ve been discussing, these actions in the states … The more states call for a term limits convention, it will put more pressure on Washington to act. Philip Blumel: So, three states so far. I think we’re targeting 10, right? How many states are US term limits really focusing on meaning sending people in the streets, in the Capitals and expending some money? Nick Tomboulides: Well, we have volunteers in all 50 sates. There’s no state in which some kind of term limits activism will not be taking place but the five states that we are targeting with the most resources this year are Kentucky, West Virginia, Georgia, Arizona and Utah. These are the states where we’ve had the most success at recruiting candidates for the state legislator and incumbents to sign our pledge committing themselves to the term limits resolution. Nick Tomboulides: In three of these states we’ve already passed a single chamber which means we’re half way there, we just need to go to the second chamber and capitalize on it. So these are the five states we have the strongest chances of passage in 2019 and we’re putting most resources. Philip Blumel: What states are new on the list of states that were focused on because I noticed some of those we’ve won the first chamber already so we clearly have made a lot of progress. I haven’t heard Vermont discussed a whole lot. What’s the story about … What’s going on in Vermont? Nick Tomboulides: Well Vermont is very interesting. They have the duo of US senators with the most collective time in office. Bernie Sanders and Patrick Leahy collectively have more experience than Methuselah. I think they are over 70 combined years of senate experience. Nick Tomboulides: So, you wouldn’t necessarily think it would be a haven for term limits but our experience has shown us that it is. I mean, it’s considered mainly a progressive leaning state. The Democrat progressives in Vermont are for term limits. They want fresh ideas, turn over. They want to help get money out of politics. Term limits is a great way to attack that and of course the Republicans, they are dissatisfied with the two Democrat senators who have just overstayed their welcome. Nick Tomboulides: In Vermont, we actually have a bill that’s gotten filed by representative Bob Helm in the state house. It does not have a number on it yet but that is going to be the starting point to see what we can do with the term limits convention up there. Philip Blumel: Okay great. During the elections in 2018, we went around and had state legislators sign pledges saying that if they were elected or reelected, that they promise to cosponsor the tournaments’ convention bill in their state. Which states did we collect the most of those pledges in? Nick Tomboulides: We collected the most pledges in Georgia, Arizona and West Virginia. I think in all three of those states we have at least 20 pledges which is a significant number and we don’t just have, you know, pledges from newer members of the legislator who might be more disposed toward term limits. We’ve got leadership members who’ve signed onto our pledges in those states. Nick Tomboulides: For example, the senate present of Arizona has signed our pledge. We’ve got committee chairman in Georgia who have signed onto our pledge which gives us a really great chance of moving the resolution in those states. Philip Blumel: Okay. Now, for our listeners who want to get involved especially that live in these states where these bills are being dropped, what should we be doing as activists to make sure that these bills get listened to, that they get heard, that they get voted on and that they pass? Nick Tomboulides: In all of these states that I’ve mentioned the five key target states, as well as several others, we have activists on the ground who are scheduling events. They are scheduling visits to the Capital which means they are going to bring a group of people into the Capital, for a day, we’re going to feed you lunch, you’re going to come in, you’re going to visit with your state legislators and tell them how important term limits is to you. Nick Tomboulides: Remember, politicians don’t wake up every day saying how do I pass term limits? They are only going to do it without outside pressure from the voters, from their constituents. So in all these states we’re setting up days at the Capital, it might even coincide with term limits day coming up in February, we’re going to have the opportunity to go out, talk to your legislators, tell them why term limits is important to you and get them to do the right thing. Nick Tomboulides: If you go to termlimits.com, the first link that you’re going to see right at the top of the page is to sign the US term limits petition. When you sign that petition you will automatically be enrolled in email updates about national happenings on the term limits scene as well as what’s going on in your state and your community so I encourage, go to the website, sign the petition. Termllimits.com. Philip Blumel: Okay. So if you’re in Georgia and you’ve signed the petition, then you’re going to get an email saying, “Hey, on February 27th, term limits day, we’re going up to the Capital to go door to door to push for the bill,” or whatever it is that you’re doing. Philip Blumel: Okay, got it. Great. Nick Tomboulides: Yeah. The bills’ all go through legislative process, you know they don’t just immediately go to the floor and get voted on. They have to go through subcommittees, they have to go through committees and we have a team that’s keeping track of all that. When a bill goes into a subcommittee or a committee, we will send you an action alert you can click on and send a message to the members of that committee encouraging them to vote for it. Philip Blumel: Right. So everyone keep an eye out for the actions alerts and when you get one, act on it immediately. It’s super important. There’s usually, especially with these action alerts you’re talking about regarding a committee vote, that could come up really quick and sometimes we have 24 hours to make our stand and so when you see that action alert for the US term limits, please click on it, read it, do it. Philip Blumel: It’s usually just sending an email to a particular legislator or group of legislators or going to our page and using our tool to send a message or making a quick phone call or something like that. It’s something very simple but when a lot of citizens are doing it, it’s enormously powerful. Nick Tomboulides: Sometimes they won’t give you any notice on the committee hearing because they don’t want you contacting them. Nick Tomboulides: They don’t want to hear it from their constituents so it’s important that our people always be one step ahead of the swamp dwellers. We need to be on top of this, we need to get those messages into our state legislators so sign the petition and look out for those alerts we’re sending out. Stacey Selleck: Chicago term limits opponent indicted for corruption. On January 2nd the FBI lodged a 37 page criminal complaint against Edward Burke, a 50 year incumbent on Chicago’s city council. Since 1983, he has chaired the city’s powerful finance committee. Speaker 4: I’ve been in office since 1969, see. Stacey Selleck: During that time, he has apparently also been using his position to shake down individuals and companies for money. Speaker 4: I run the Chicago machine. I know it like the back of my hand. Stacey Selleck: It is Chicago after all. Stacey Selleck: The FBI also says that Burke withheld a city permit from a restaurant owner who wanted to renovate until the businessman wrote Burke a big fat check, et cetera, et cetera. Speaker 4: You’ll never take me alive, see. Stacey Selleck: But this case should arise in Chicago is hardly a surprise. As the University of Illinois study from 2018 called Chicago the most corrupt city in the US. A survey in 2016 found that over 90% of Chicago based business leaders observe cronyism in city government. Stacey Selleck: Of the 10 largest cities in America, Chicago is also the only one without term limits on its city council or mayor. Speaker 4: We have term limits, it’s called elections. Stacey Selleck: Term limits discourage corruption as corruption is highly correlated with 10 year in power as long 10 year both breeds arrogance and provide opportunity. Term limits also encourage transparency as the critical institutional knowledge is not bottled up among a team of entrenched incumbents, instead, you have a regular stream of ex council members constantly being created who have intimate knowledge of the system. Stacey Selleck: Meanwhile, new members come in and review the systems with fresh perspectives. Speaker 4: Fresh perspectives, I don’t like it. Stacey Selleck: Voters know this and in 2018, about 60% of the voters told pollsters they supported term limits on the Chicago council. In 2018, there was a serious attempt to put mayoral term limits on the Chicago ballot however, under state law, only three ballot questions can appear on the ballot in one election. Stacey Selleck: The Chicago city council promptly approved additional advisory questions so that the term limits measures would be crowded out. Governor Quinn called this a sabotage tactic. It also fair to call it corrupt. Guess who sponsored the measure to boot term limits off the ballot? You guessed it, Alderman Ed Burke. Philip Blumel: These congressmen in office are doing a terrible job. I mean, we’re in the midst right now of the longest shutdown of the Federal Government in our history and what’s easy to forget is that, this is not just a matter of the current congress versus the current president. We’ve had 21 federal government shutdowns in the last 43 years. I mean, this is a long term intractable problem that just showcases the disfunction of US Congress in fulfilling one of it’s most basic tasks which is passing a budget. Nick Tomboulides: And congressional 10 year has been steadily rising over the last 50 years. It actually seems … We haven’t gone out and done any kind of statistical analysis on this but it just seems that the longer we allow members of Congress to stay in office, the more dysfunctional the system gets and the more likely we are to have these kinds of impasses and government shutdowns. Nick Tomboulides: But my question is, if nonessential employees aren’t getting paid, why are we still paying Congress? Why are members of Congress exempt from the shutdown? Can we at least shut them down too so they have to deal with the same pain and misery all these other government employees are dealing with? Philip Blumel: That’s a good question. They are getting their paychecks huh? Nick Tomboulides: They are and there have been a couple of congressmen who’ve spoken out against that on the left and the right. You had Alexandra Cortez, congresswomen from Queen. She’s a freshman, say that this was wrong. You had Dan Crenshaw, Republican from Texas. He said he cannot in good conscience get paid while federal employees futures hang in the balance because of the shutdown. He actually asked the administrative officer to withhold his pay until they come to an agreement on the budget but I don’t think a single member of Congress should get paid during this impasse. It’s just wrong. They are not doing their jobs, they are not listening to the American people and they shouldn’t get paid. Philip Blumel: And again, I want to go back to Congress on this because really since 1974 when they passed the Budget Control Act, it’s really been Congress whose been in charge of the budget process in this country and since then, they’ve only managed to pass all 12 appropriation bills on time, that is before October 1st, four times in all those years and in fact, 16 years went by when they couldn’t get a budget passed once on time. Philip Blumel: When they can’t pass a budget, what they do is they just pass a short term continuing resolutions to keep the government funded and when they can’t even do that, that’s when they have the shut down which is what we’re on number 21 right now. Philip Blumel: The dysfunction is almost … It’s unbelievable. Nick Tomboulides: Exactly right. Exactly right. And the standard just seems to be getting worse. I know there were about four spending bills that were approved a few weeks ago to reopen various parts of the government, you know, proponents could interpret that as an effort to try to end the stand off. Nick Tomboulides: The Senate is not going to budge on those. They’ve gotten … I think they need 60 votes to end this and they like eight votes and Mitch McConnell isn’t even really trying. Mitch McConnell is blaming Schumer. Schumer is blaming McConnell and it’s just showing Washington is all about scoring political points. It is all about beating your opponent, making a partisan statement instead of sitting down and deciding what’s best for the country. Nick Tomboulides: We have a highly polarized Congress and the zeal to get reelected every two years, every six year is the central part of that. Philip Blumel: Yep. The shutdown is a crisis of some sort. It’s certainly being treated as such and I suppose at some level it is but when I really look at this whole budget issue in this country, one ongoing chronic crisis that has potential to put us under is the fact that our Congress cannot pass a balanced budget which they’ve done only four times since 1975, four times. Philip Blumel: They can’t pass a balanced budget. They can’t pass it on time and then they can’t even keep the government open. Philip Blumel: We need to press the reset button on Washington, DC. Nick Tomboulides: And that is totally a bipartisan issue just like term limits. 80% of Americans, regardless of party, support a balanced budget amendment to the Federal Constitution. 82% support a term limits amendment to the Federal Constitution. The face that Congress focuses only on partisan back biting and won’t even hold hearings on those issues, which an overwhelming number of Americans support, that in an of itself is a case for term limits. Philip Blumel: Yeah, it is. Nick Tomboulides: We have captured Congress. We have a Congress that is unresponsive to the people who elect them and who pay their salaries. That could be declared a national emergency. That the American people have lost control of Congress and we’re not going to get it back unless we pass this amendment. Philip Blumel: Good point. That is a national emergency. Philip Blumel: New faces in Congress won’t change old ways. That’s what the headline says above the letter to the editor by Nick McNulty of Wyndham, New Hampshire. It appeared in the Massachusets based Eagle Tribune on January 9th. We tracked Nick down and asked him to read to us. Nick McNulty: Much positive press coverage and [inaudible] rhetoric created the inauguration of the new 116th Congress earlier this week and for good reason. The American people have sent a record number of congresswomen to Washington with this Congress including Massachusets first female African American elected to Congress and the first Muslim and Native American congresswoman respectively. Nick McNulty: These are all great achievements. I’m personally in favor of any man or woman of any color or race going to Congress that has not been there before. A few things are better for the health of our republic than freshman congresspersons. Nick McNulty: However, moments after these new women with their fresh ideas took their oaths of office, 78 year old and 31 year congressional veteran Nancy Pelosi reclaimed her perch as the Speaker of the House. Also, 79 year old, 38 year congressional veteran Steny Hoyer moved from the house whip to majority leader making way for the 78 year old and 25 year congressional veteran, James Clyburn to take over as the new house whip. Nick McNulty: So we see while the narrative of the most diverse class of lawmakers in history and the new Democrat party brings sweeping change to Washington makes for compelling television but the fact of the matter is that the incoming representatives such as Alexandria Ocasio-Cortez, [inaudible 00:16:50], and Ayanna Pressley will be nowhere near the levers of power for at least another six to twelve years and that is only if they can be reelected to those terms and managing the favor of the current party leadership while they do so. Nick McNulty: In truth, the only way any of these freshman congresswomen or new members of any future Congress can be truly empowered to effect the change Washington needs is through term limits. The imposition of term limits on house and senate leadership seats in the near term and eventual return to term limits on all members of the federal legislative branch through states, article 5 conventions. Philip Blumel: Good work Nick. We encourage people to write letters to the editor on the subject of term limits and if yours gets published, send it to us, we might read on the podcast. Speaker 7: Term limit who? Duke Decter: Term limit Mitch McConnell and Nancy Pelosi. Speaker 7: That’s not funny. Where’s all this laughter coming from? Order! Order in the house! This is the most elite group in the land. Order! This is the greatest deliberative body in the world! Speaker 7: Order! Order in the house! Paul Jacob: The world wants term limits. The Economist magazine has announced its country of the year. It’s Armenia. The idea behind the award is to recognize the nation that has improved the most during the past year. The honorific implies not rosy assumptions about the future. Obviously, a country can backslide. The Economist editors admit that this proved to be the case with prior winners France and Myanmar. This year, Malaysia and Ethiopia were in the running. Paul Jacob: Malaysians managed to oust a corrupt Prime Minister and the new leader of Ethiopia has sought to encourage freedom of speech and liberalize the economy but all things considered, the magazine regards the advances in these countries to be too contradictorily or uncertain to merit the most improved designation. Paul Jacob: Progress seems more definitive in Armenia where former President [Serzh Sargsyan did his darnedest to escape presidential term limits. As is attempted by so many of heads of state around the world. Sometimes the power grabbers succeed and sometimes they don’t but everywhere most voters oppose such a [inaudible 00:19:23]. They know how easy it is for an incumbent to shove his way to perpetual power no matter how unhappy they may be with him. Paul Jacob: Citizens know the value of term limits. Armenia’s good news is that Sargsyan’s attack on term limits failed, dramatically. He resigned after massive demonstrations. An opposition figure, Nikol Pashinyan, won power on a wave of revolution against corruption and incompetence. A Putinesque potentate was rejected. Paul Jacob: Just what the world needs to see, wants to see, a lot more often. This is common sense. I’m Paul Jacob. Philip Blumel: The term limits convention bills are dropping in the states and it’s time to act. Keep an eye out for our action alerts via email. If you’re not on our list, please go to www.termlimits.com and sign the online petition. While you’re there, send a message to your federal congress members and ask them to cosponsor the congressional term limits bill that’s been introduced by Senator Cruz and representative Rooney. You can do that at www.termlimits.com/legislators. Philip Blumel: And it’s time to start thinking about how we’re going to show public support for term limits on the first ever term limits day on February 27th. Philip Blumel: Lastly, please subscribe to the No Uncertain Terms podcast if you haven’t already. You can use the podcast app on your iPhone or Google Play or Stitcher on your Android device or go straight to iTunes and subscribe and also, while you are there, please rate and review us. Philip Blumel: Let’s stick together and work hard over the next few months. 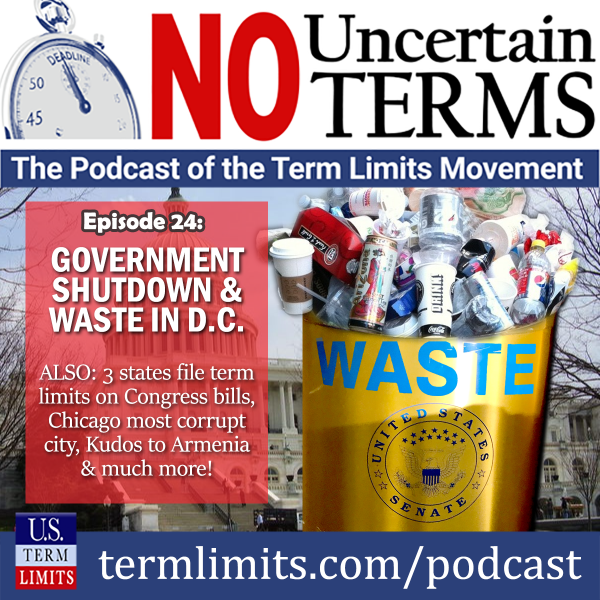 Don’t miss a single episode of No Uncertain Terms. We’ll be back next Monday. Thanks. Philip Blumel: Term limit who? Philip Blumel: Term limit Mitch McConnell and Nancy Pelosi. Philip Blumel: That’s not funny.